Reef-dwelling Christmas tree worms (Spirobranchus spp.) are common coral associates. Their calcareous tubes are usually embedded in the coral skeleton and can be closed by an operculum. Tubes not overgrown by coral tissue either remain bare or become covered by algae. Despite their widespread distribution, high abundance and striking appearance, little is known about the impact of these worms on their hosts. We quantified visible coral damage caused by Spirobranchus in Curaçao (Southern Caribbean) and found that 62.6% of worm opercula (n = 1323) caused abrasions and tissue loss in their hosts. Filamentous turf algae, known to be potentially harmful to corals, covered 76.9% of the opercula. Examination of the six most frequently inhabited host species showed a variation in the damage percentages, although this was independent of the presence of epibiotic algae on 78.4% of all opercula. Since injured corals are more susceptible to diseases, the overall negative impact of Spirobranchus worms on their hosts may be more severe than previously assumed. Reviewed by E. Kupriyanova and D. Martin. Coral-dwelling tubeworms of the genus Spirobranchus (Polychaeta: Serpulidae), known popularly as Christmas tree worms because of their twin-conispiral branchiae, are commonly found on coral reefs. They live as associates of a large number of host coral species, on which they can form aggregations (Hunte et al. 1990; Hoeksema and Ten Hove 2017a; Hoeksema et al. 2017; Martin and Britayev 2018). Their planktonic larvae usually settle on abraded coral surface (Hutchings 1986) and, more occasionally, on rubble and shells of giant clams (Nygaard 2008; Van der Schoot et al. 2016). The calcareous worm tube is usually overgrown by the host coral and remains embedded within its coral skeleton, except for its opening (Hoeksema and Ten Hove 2014). In this way, the worms can survive over 40 years (Nishi and Nishihira 1996), even if the host becomes overgrown by sponges and octocorals, which in turn can act as replacement hosts (Hoeksema et al. 2015, 2016; García-Hernández and Hoeksema 2017). When threatened, the worms rapidly retract inside their tubes, closing them by the calcified operculum, which is attached to a fleshy stalk (Hoeksema and Ten Hove 2014; Pezner et al. 2017). Failing to retract in time entails risk of predation by fish (Nishi and Kikuchi 1996; Hoeksema and Ten Hove 2017b). Probably as extra protection, many Christmas tree worms have a sharp spike on the margin of their tube opening as illustrated by Hoeksema et al. (2017: Fig. 1) and antler-shaped spines on their operculum (Hoeksema and Ten Hove 2014: Fig. 1). Moreover, the operculum may become covered by various kinds of epibionts, such as algae, corals, sponges and other serpulids (Hoeksema et al. 2018; Perry et al. 2018a). The presence of Spirobranchus can be of disadvantage to the host corals when incorporated tubes undermine the structural integrity of corals, causing them to break more easily (Hutchings 2011). Dead worms leave empty holes behind, which can become inhabited by cryptofauna (e.g., hermit crabs, fish) and turf algae (Schuhmacher 1977; Hutchings 1986; Clarke and Tyler 2003; Böhm and Hoeksema 2017), which may prevent corals to regenerate and heal. Spirobranchus worms can also irritate and stress the surrounding polyps (Borger 2005; Hoeksema et al. 2018, 2019) and even smother and kill their hosts when they occur in high densities (Samimi Namin et al. 2010). In fact, the opercula can serve as a substrate for epibiotic turf algae and, when the worms are extended, opercula with or without algae can cause damage to the coral surface, as demonstrated in Indo-Pacific reefs (Hoeksema et al. 2018, 2019). 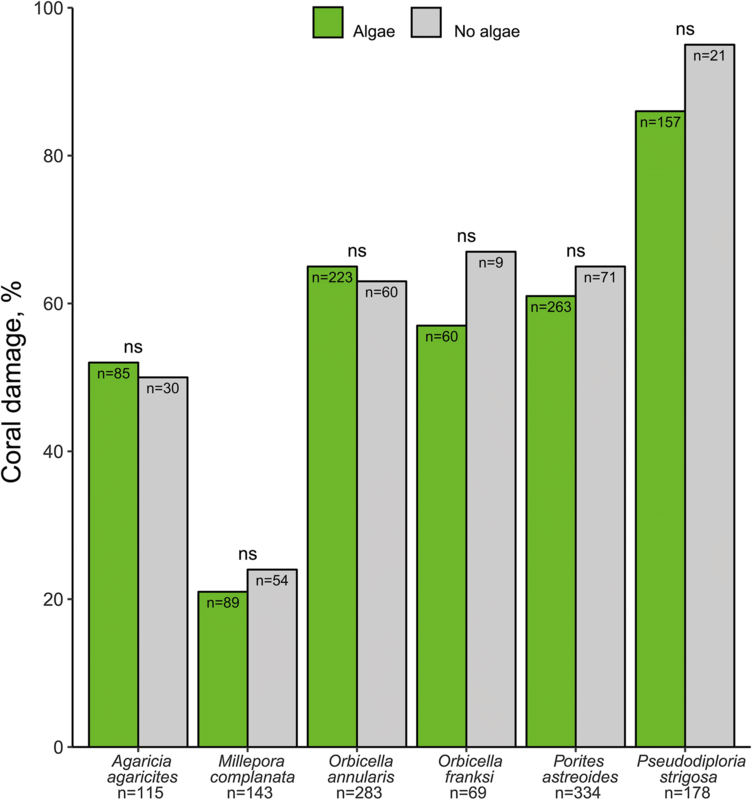 Turf algae are known to cause stress and partial mortality in corals (McCook et al. 2001; Vermeij et al. 2010; Longo and Hay 2017). Therefore, we surveyed reefs at Curaçao to assess whether Spirobranchus could be harmful to Caribbean host corals with special emphasis on the possible involvement of opercula and the relationship with epibiotic turf algae on the opercula. Additionally, we analysed whether damage varied among host species. Fieldwork on worm-inflicted coral injuries took place in February–March 2015 on fringing reefs along the leeward coast of Curaçao. The presence of worms on their host corals was recorded by scuba diving in belt transects, each 30 m2 in surface area (ntot = 52.8). The records were from four different sites (Sites 1–4) that were at least 10 km apart (Fig. 1), and at 5, 10, and 15 m depth (Table 1). The worms and their hosts were photographed to document damages visible as tissue discoloration or loss on the adjacent coral surface. Only worms for which could be determined that their opercula were harmful or not were included in the analyses (i.e., 1323 of the total number of 2625 worms found; Table 2). In the remaining 1302 cases, damages were not determined either due to the critical spot where an operculum may touch the coral surface being obscured by worm’s branchiae or by the coral’s tentacles, but also by a wrong angle of the pictures. Even though many encountered coral colonies hosted more than one worm, each specimen of Spirobranchus was counted as representing a single association (Table 2). Host corals were identified based on Humann and DeLoach (2013) and the identity of the Spirobranchus specimens was confirmed according to Ten Hove (1970) and partly verified by the last author. The six most frequently encountered host species, each harbouring > 50 worms, were selected to analyse the interspecific variation in the occurrence of damages; only 1150 worms of these six species together could be used in the analysis (Table 2). The mean number of worms per host coral colony varied from 1.4 to 3.9 among these six species (Table 2). Damage variability among host species, as well as the relationships between opercula with and without algae and damages, was examined with the Fisher’s exact test of independence in R (McDonald 2014). Coral damage caused by algae on worm tubes was not quantified because the latter were unequally embedded in the coral, so that the exposed parts varied much in size (Fig. 2). 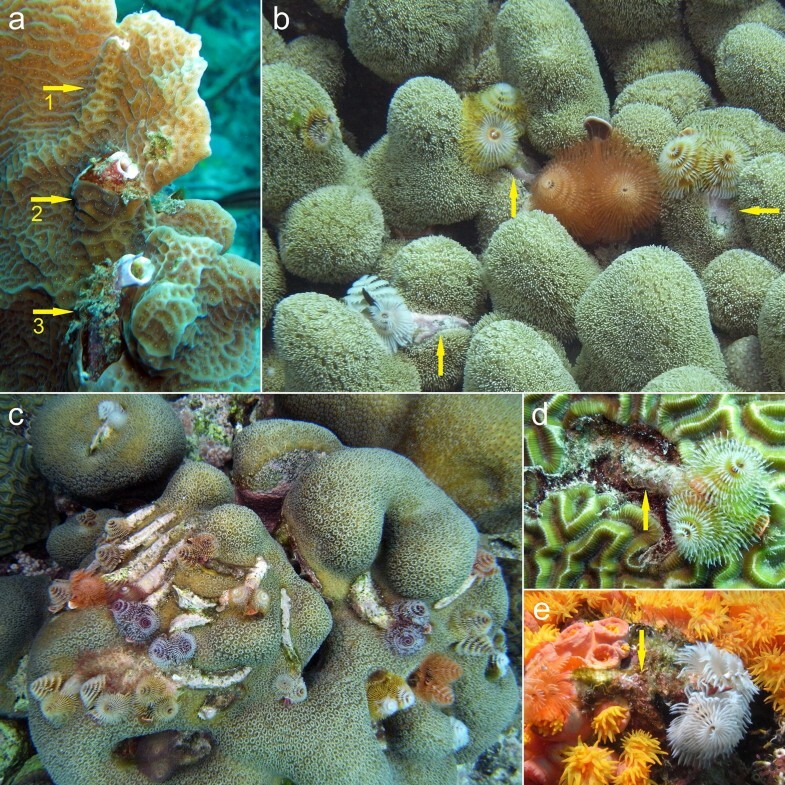 Twenty-one host coral species were infested by Christmas tree worms, all of them belonging to Spirobranchus giganteus (Pallas, 1766) (Table 2). Worm tubes showed various degrees of coral overgrowth (Fig. 2a), including some not overgrown that were situated in depressions on the colony surface, suggesting that coral growth had slowed down beneath and around them (Fig. 2c, d). Exposed tubes could become covered by crustose coralline algae (Fig. 2b) or filamentous turf algae, which harmed the coral surface alongside the tubes (Fig. 2d, e). 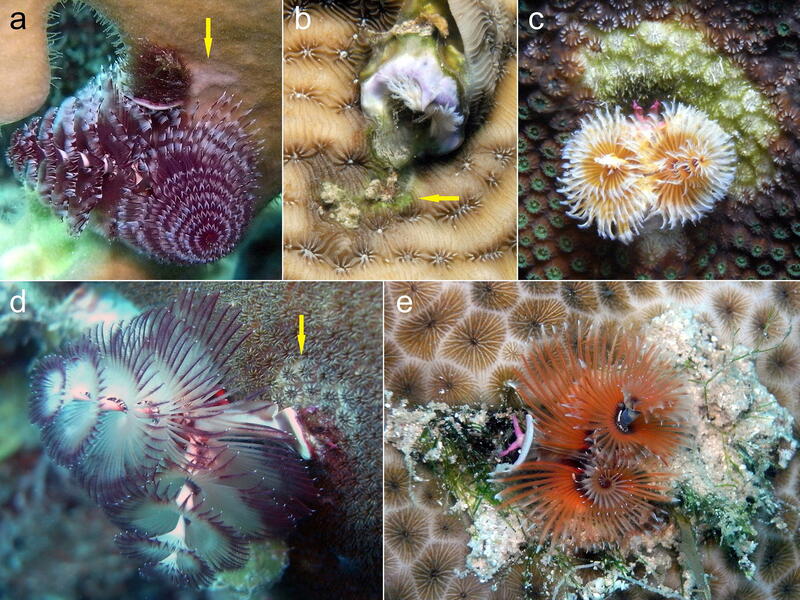 Of all 1323 worms analysed, 829 (62.6%) injured adjacent coral tissues with their opercula (Fig. 3; Table 2). The six host species with the highest numbers of associated worms, varied significantly in the proportions of worms causing operculum-induced injuries (n = 6, p < 0.0001, Fisher’s exact test), ranging from 24% in the hydrocoral Millepora complanata to 87% in the scleractinian Pseudodiploria strigosa (Table 2), which showed, respectively, the lowest and highest damage levels (p < 0. 0001, Post hoc tests with Bonferroni correction; Fig. 4, Table 3). A large portion (78%) of the opercula in worms infesting the six host species was covered by filamentous turf algae (Fig. 3), which did not differ significantly in damage level compared with those without algae (Fig. 4; Fisher’s exact test). Five scleractinian coral species and one milleporid showed a strong interspecific variation in damage caused by the opercula of Spirobranchus worms. The lowest damage shown by Millepora complanata (Fig. 3a) in comparison with the scleractinians may be related to its thin coenosarc, as well as to its different skeleton anatomy (pores instead of protruding calices), thereby showing a higher tolerance to physical disturbance (Lewis 1989, 2006). Pseudodiploria strigosa, a common host for S. giganteus (Hunte et al. 1990; Marsden et al 1990), shows the highest frequency of worm-induced injuries. This coral species is much under attack by corallivorous Coralliophila snails in Curaçao (Potkamp et al. 2017a, b), which also cause abrasions on the coral surface. Since Spirobranchus larvae settle most easily on abraded coral surface (Hutchings 1986), this may facilitate further damage caused by the worms. 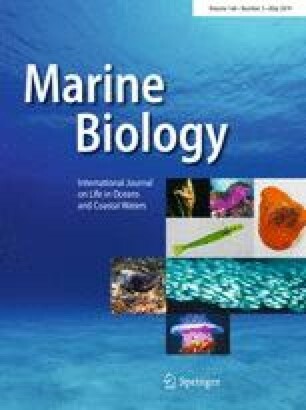 The lack of influence of the epibiotic algae on Spirobranchus opercula is not consistent with previous studies on the impact of turf algae on corals (McCook et al 2001; Swierts and Vermeij 2016; Longo and Hay 2017). It is partly consistent with observations on Indo-Pacific reefs, in which such epibiotic algae increase damage in corals of two species of Porites but not in two of Montipora (Hoeksema et al. 2018, 2019). Therefore, our results suggest that the opercula themselves are the single cause of coral damage in Curaçao, although this does not imply that turf algae by themselves cannot cause damage to corals in the Caribbean (Vermeij et al. 2010; Wild et al. 2014). Regeneration of coral wounds depends on their size, shape and position, but also on the coral species, shape, size and depth (Bak et al. 1977; Bak and Steward-Van Es 1980; Meesters et al. 1996, 1997a, b). Damage in corals caused by Spirobranchus may be difficult to heal, which becomes obvious when worm tubes cannot be overgrown by coral tissues (Fig. 2) or when vacated tubes become inhabited by other organisms (Schuhmacher 1977; Hutchings 1986; Böhm and Hoeksema 2017). Such damage may also cause the corals to become more susceptible to diseases (Katz et al. 2014; Lamb et al. 2014). Coral-associated Spirobranchus are often reported as being beneficious for the host, by providing protection against predators or by enhancing water circulation around the coral polyps (DeVantier et al. 1986; Ben-Tzvi et al. 2006). Each of these advantages appear to be small in scale and reported once, with the first one being cited repeatedly (Nygaard 2008; Rowley 2008; Montano et al. 2017; Perry et al. 2018a; Montalbetti et al. 2019). Conversely, our present study and previous results (Borger 2005; Samimi Namin et al. 2010; Hoeksema et al. 2018, 2019) reveal a relevant and widespread negative impact of Spirobranchus worms on their hosts. 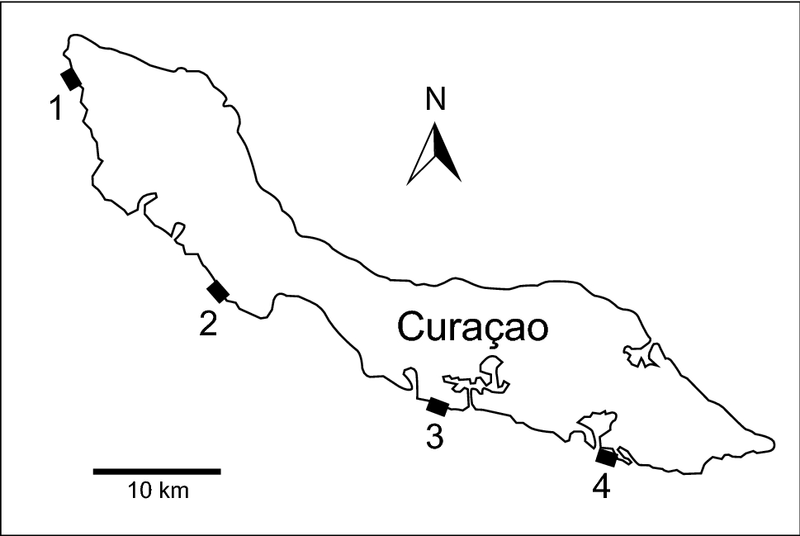 It is remarkable that damage caused by worm opercula at Curaçao in the Caribbean (63%, n = 1323) was found to be much more frequent than at Koh Tao in the Gulf of Thailand (21%, n = 749; Hoeksema et al. 2019). This constitutes a significant difference (p < 0.0001, Fisher’s exact test), for which various hypotheses can be given that are either related to environmental differences or to the various worm and coral species involved. For instance, opercula in the Caribbean Spirobranchus giganteus are generally larger and more heavily branched than those of S. corniculatus (Grube, 1862), the species most commonly found in the Indo-Pacific (ten Hove 1970; Willette et al. 2015; Perry et al. 2018b). Polyp morphology and the position of the worm in relation to the coral’s surface may be factors that can affect the damaging effect of the opercula (Hoeksema et al. 2019). Therefore, further studies must address the balance between positive and negative impacts of Spirobranchus worms on their host corals, enabling a decision whether their relation must be considered amensalistic, in which the worms harm the coral but are not harmed themselves, or mutualistic, in which both partners eventually benefit, and/or in which circumstances these two strategies prevail. Such a knowledge may be relevant for the management and preservation of coral reefs if, for instance, external circumstances (e.g., pollution, turbidity) may weaken the coral’s resistance, thus inclining the response of the worms towards a more parasitic behaviour. We thank staff of CARMABI (Curaçao) for hospitality and logistic support, and Dr. Mark Vermeij for his constructive comments on an early draft of the ms. We also thank two reviewers and the editor for their help in improving this paper. The second and third authors received financial support from the Jan Joost ter Pelkwijk Fund and the Alida M. Buitendijk Fund at Naturalis.